Here is your new rainboot. Don’t get caught walking long distances in the flat, flexible types. 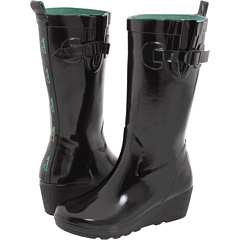 This rainboot is SWEEEEEET! It will offer you much more comfort with it’s rigid wedge bottom. Now go get your boots! This one comes in 3 colors to go with your New Year’s dress. The maryjane strap keeps the shoe on your foot and the peep toe prevents toe squish. 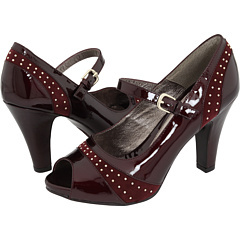 The platform adds 1/2 inch which only gives 2 1/2 inch heel raise. 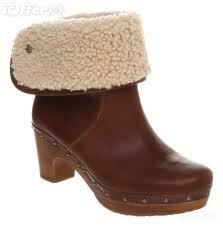 For you CRAZY UGG wearers! Make sure to go get these instead of the flexible, flat versions. Your feet will definitely feet better at the end of the day! These platforms are deceiving with really a 2 1/2 inch rise in the heel from the forefoot. The vamp comes way up the foot, enabling comfort without having to crinkle the toes to keep the shoe on. This is not a shoe for those with weak ankles or a high potential for ankle injuries. They have a nice toebox (almond-shaped) and not-so-bad-price in comparison to other similar styles. I’ve said it before with Tsubo, they make a fantastic wedge bottom. 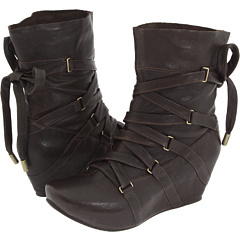 This boot is no exception! Very comfortable with it’s rocker-sole! An over-the-knee boot recommendation is in order! Here it is with a nice wedge bottom and not-so-pointy toebox.